Veteran actor James Whitmore, probably one of the most well-recognized and beloved faces to have ever graced the American stage and screen, passed away today after a struggle with lung cancer. He was 87. The folks of my generation probably best remember Whitmore from The Shawshank Redemption. He played Brooks in that film: the "institutionalized" prison librarian who is released into a world that he no longer recognizes. Director Frank Darabont liked him so much that he also put Whitmore in The Majestic a few years later. Whitmore's remarkable career went all the way back to the World War II era. He won a Tony in 1948 for his lead role in Command Decision (also his first Broadway performance). A year later he made his first movie, The Undercover Man. And for the next half-century he was a fixture in film and television. But he still returned to the stage on occasion, especially with his one-man shows in which Whitmore portrayed Harry Truman, Teddy Roosevelt, and Will Rogers. Most of those were eventually adapted to screen, with Whitmore again assuming the roles. Many people will also remember that Whitmore was the orangutan that presided over Taylor's "trial" in the original Planet of the Apes. And there was that terrific performance that he turned in for The Twilight Zone episode "On Thursday We Leave For Home", among many other things. 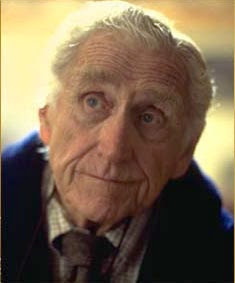 But for some reason, along with The Shawshank Redemption, I most remember James Whitmore for all of those television commercials that he did for Miracle-Gro. I did not know for certain that he was such an avid gardener until I read his obituary, but just from watching him in the ads, I got the sense that he was sincere and definitely knew what he was talking about. The man was apparently gifted with a green thumb along with his extraordinary theatrical presence. Frank Darabont has written a wonderful tribute to James Whitmore on Ain't It Cool News. He was also in Them!, one of greatest scifi movies ever. D'oh! How could I have forgotten Them! ?? That movie, along with Alien and John Carpenter's The Thing, are the three best sci-fi horror movies *ever*, in my book. You know what I've always found odd? The Shawshank Redemption came out in 1994 and today it's regarded as one of THE few legitimate classics of the modern era. But it was a *flop* when it first came out! It wasn't until it was released on VHS and especially DVD, that the movie seriously took off. Much the same happened to The Wizard of Oz: only when CBS began broadcasting it on television, did that movie begin to become a classic.